Where to go in Canberra for an authentic Australian meal? Somewhere special to take overseas visitors? On a recent visit by friends from the Rotary Club of Taipei, we opted to host them at the Homestead Cafe, a rambling house in the grounds of the Gooromon Park Horse Riding Centre (near the Hall wineries). That’s right – it is situated in a horse riding centre. As we drove up in the mini-bus, we could see horses and riders silhouetted under the spotlights. “Are they statues,” my Taipei friends asked, somewhat puzzled. “No, they are real horses with people on them,” I answered. It was a shame that we were not visiting during the day, as then we would have been able to see more horse riding. And had we visited in warmer months, we could have seen the beautiful rose garden in bloom as well. But not to worry, there was plenty to draw us in. Soon, we were clamouring up the wooden steps of the country house with everyone keen to meet friends from the Rotary Club of Belconnen and try the local fare. The reason we hiked out in the middle of winter to the back of Hall was because Homestead Cafe is a special place. 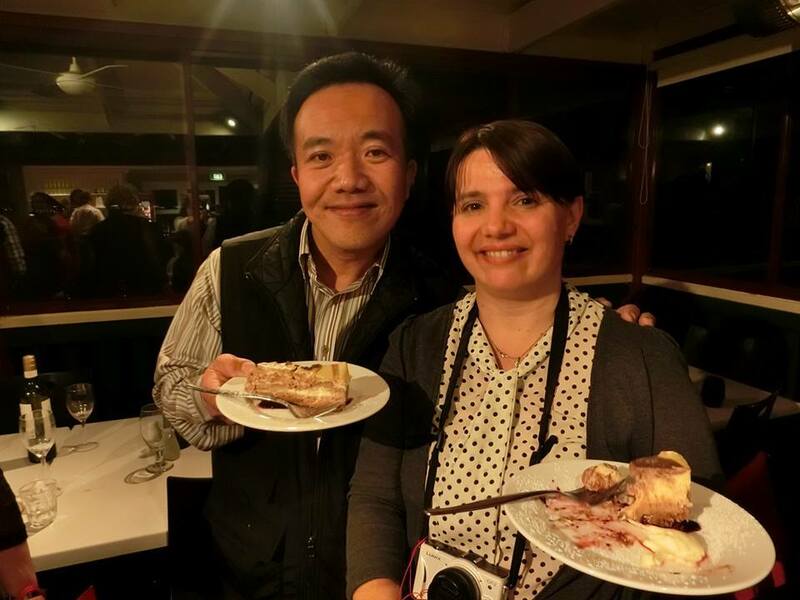 It is run by the daughter of a Belconnen Rotarian, but it is not only out of loyalty alone that we chose the venue. Chef Robyn Cooper has a special touch. A former chef at the Hyatt Canberra, she left Australia to travel the world as a chef and consultant (including at a Hotel Les Ottomans in Istanbul, voted the 10th best luxury hotel in the world). Her mother used to proudly display brochures of Hotel Les Ottomans and tell me all about her daughters travels — it really was opulent to the extreme and Robyn was revered as one of the best chefs in Turkey. 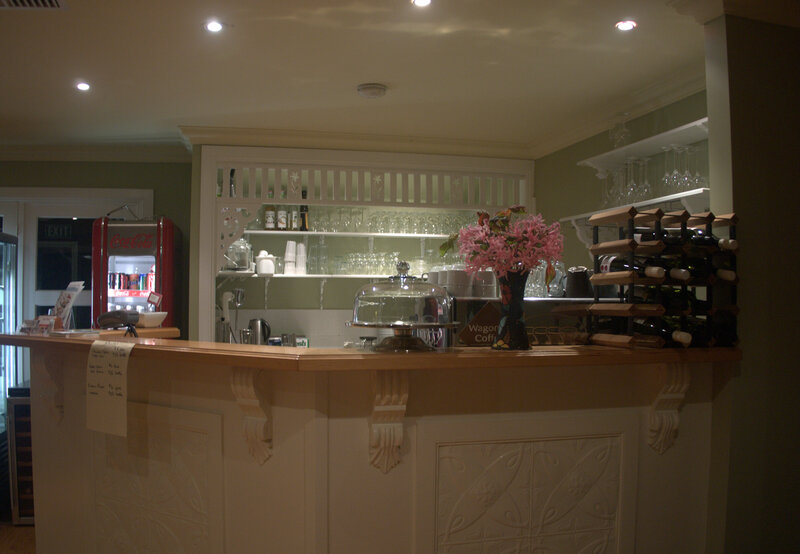 Since returning to Canberra in 2010, she started her own catering and restaurant business in this rural hideaway. 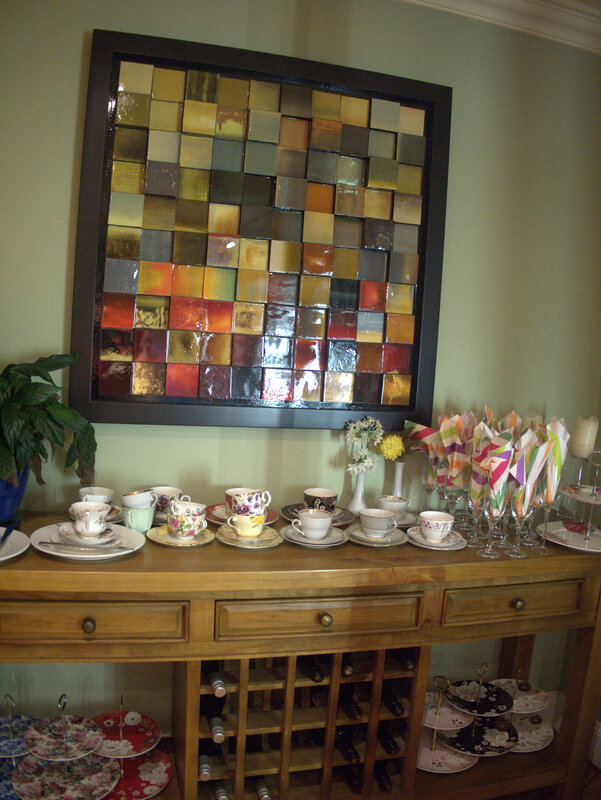 We were catered for with ‘Australian style’ food, at the request of our visitors, who wanted to try some local food. 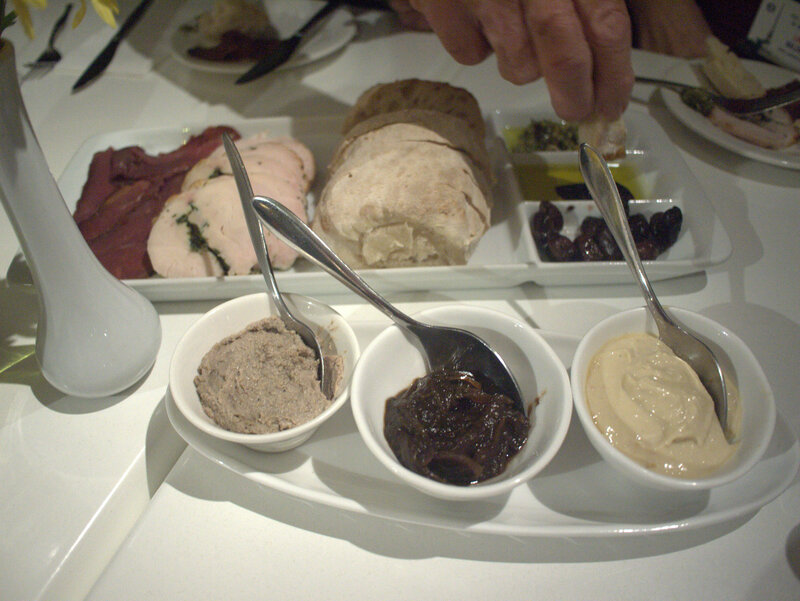 Entrée was a tasting place of duck liver pate, hummus, caramelised onions, caramelised olives, basil pesto, and Homeleigh olive oil. 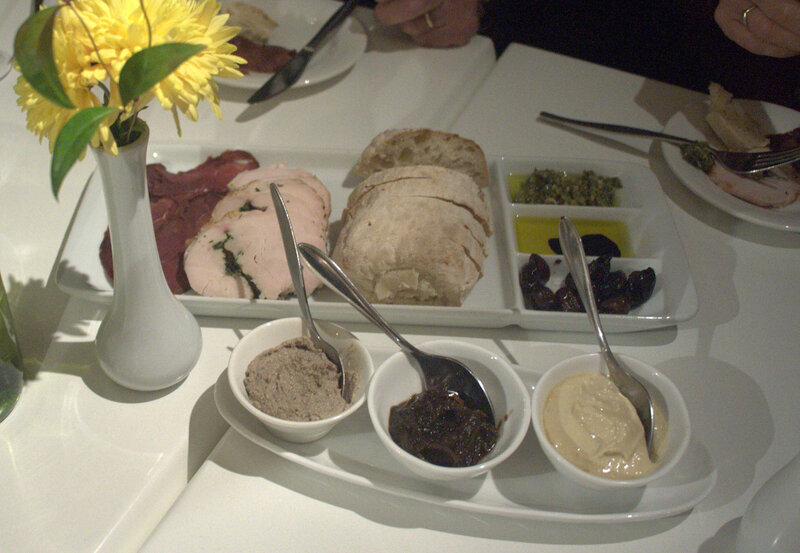 It was served with ciabatta bread, kangaroo prosciutto and lemon myrtle smoked chicken. The kangaroo prosciutto was outstanding: I found myself pausing mid-sentence just to enjoy the sensation of eating it. It was a busy evening, with me running around chatting to friends old and new. But my Taipei friend Liz kept some of the dips for me, and I am glad she did. The caramelised onions were fantastic, and later I paired them with the kangaroo fillets. And the pate was dreamy as well. I found myself going back for thirds of this shared plate of chicken breast pieces with mushroom sauce. And I enjoyed this healthy dish of steamed broccolini with almond butter. Then onto the Australian theme of the evening, starting with marinated emu fillet skewers with roasted asparagus. I hadn’t eaten emu before: it is sort of like beef, which is odd for a bird (albeit a very large bird). 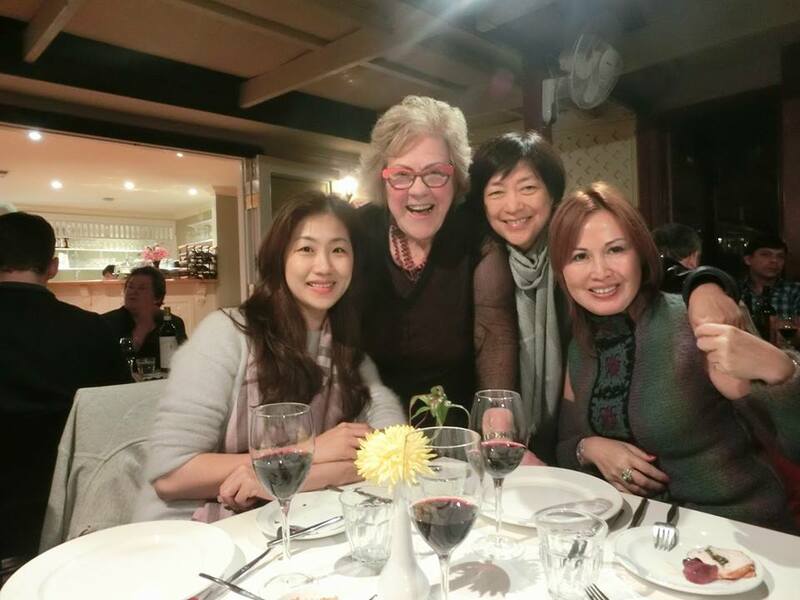 I had fun explaining to my Taipei friends that eating kangaroo meat is both healthy and ecologically sustainable. It was hard for them, though, to get past the cuteness of kangaroos — especially as many of them had cuddled a baby joey rescued by the Sleepy Burrows Wombat Sanctuary earlier in the night. 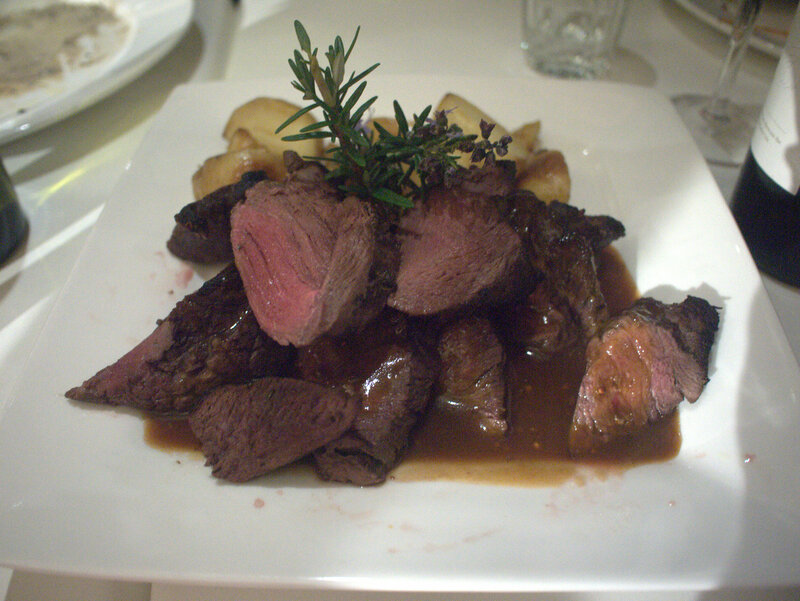 Still, the red wine and thyme kangaroo fillet was tender and delicious. After dinner, came speeches, banner exchanges, gift exchanges and a surprise: hubby was awarded a Paul Harris fellowship, and then we surprised him further by celebrating his birthday with cake. 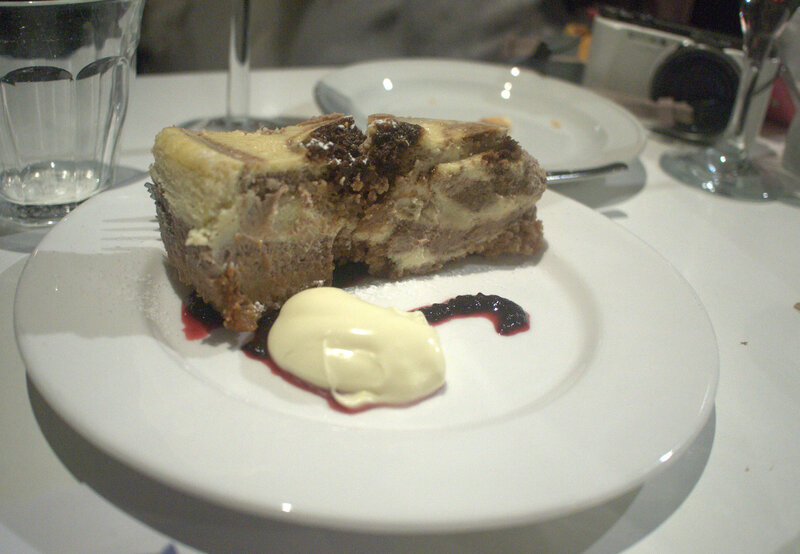 Cake was not on the menu, but it was a rich chocolate swirl cheesecake. Hubby was too busy talking and his cake got taken away, but luckily we were able to steal a piece from someone else. I held onto mine, and enjoyed it to the last guilty bite. I refused to put it down, even during obligatory goodbyes and photos. It was fresh and still gooey in the middle while slightly firm at the edges. 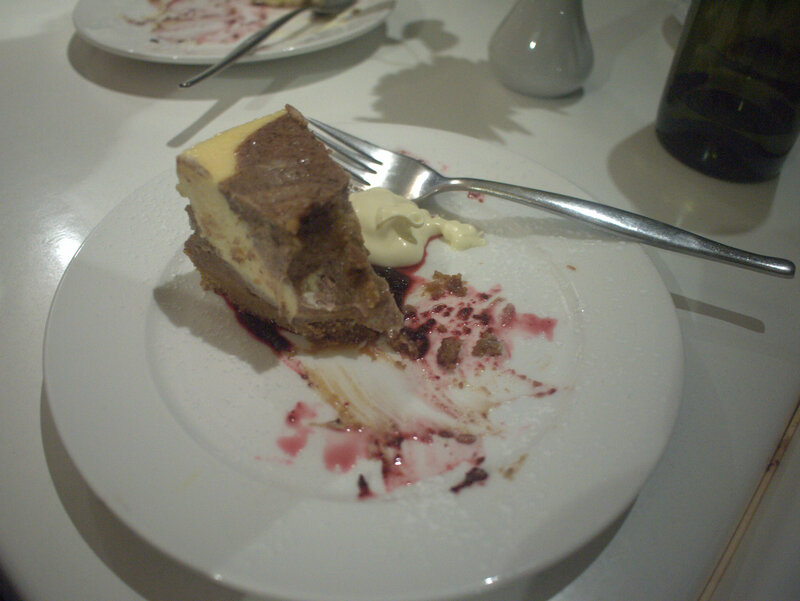 Actually, it was so good that I forgot to take a photo until half-finished and had to steal a picture of hubby’s newly obtained cake. 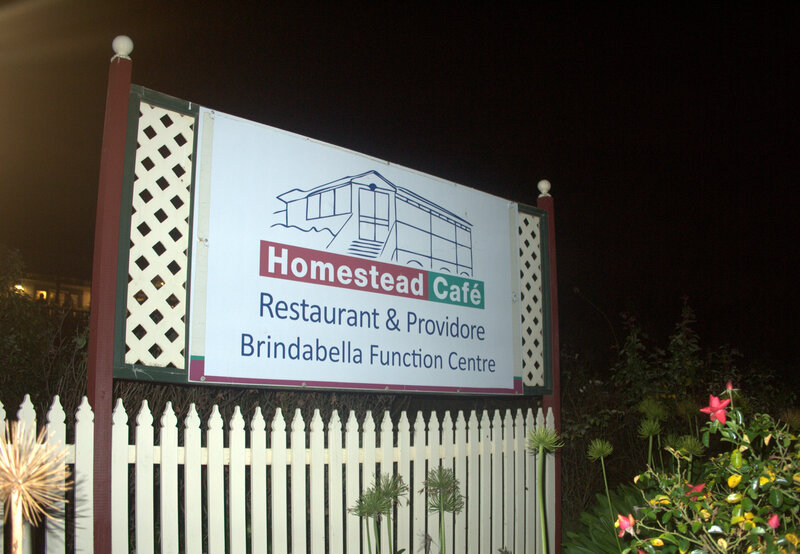 Homestead Cafe is at 214 Gooromon Ponds Road, Hall. Although not far from Canberra, there is a bit of a trick to getting there. Drive on the Barton Highway towards Yass, turn left at Wallaroo Road near all. Then turn left into Gooromon Ponds Road. Drive 2.14 kilometres (exactly) and you will see the cafe (within the horse park) on the right, just after you go down a hill.